Barbara Suggashie in her hotel room before starting the next leg of her walk Tuesday. Photo: Willow Fiddler. Barbara Suggashie takes one last look in the mirror and adjusts her hair. She then pauses and stares at the woman looking back at her. It’s a woman who is slowly changing. And she heads out the door of her hotel room to start walking. “I was talking to my husband about this for a long time,” says Suggashie, 36. 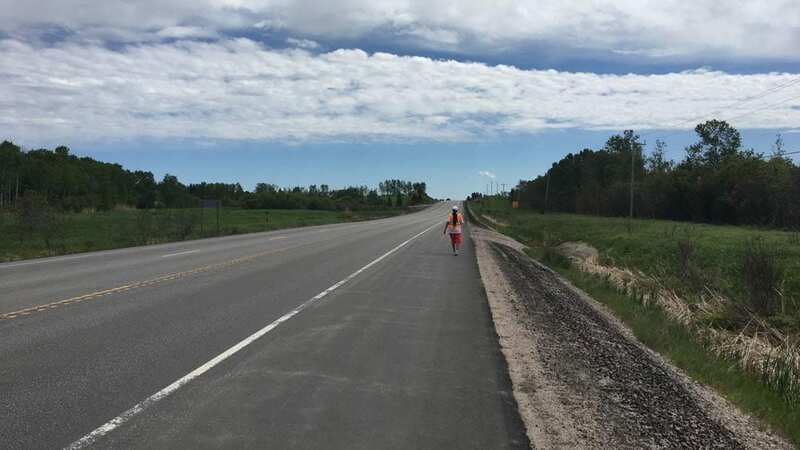 Most people driving by don’t know her or why she is walking along Highway 17 west of Dryden, Ont. They also don’t know the iPod she is using to listen to music belonged to her daughter, Kanina Sue Turtle. 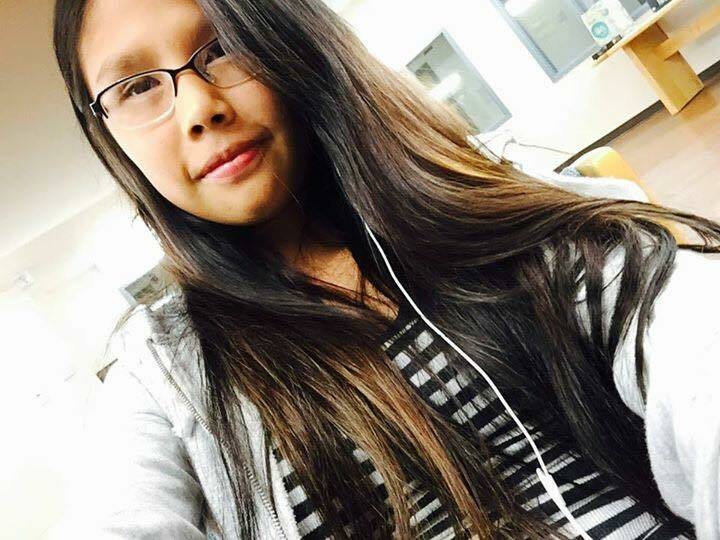 There’s a video on there, too – Kanina, 15, used the iPod to film her suicide inside a Sioux Lookout foster home. It’s that home that Suggashie is walking to. She’s seen it from the road but has never gone in. Barbara Suggashie with her son, Winter. Submitted photo. A couple weeks ago she decided to start the journey in Red Lake with her son Winter who is 12. It’s about 320 kilometres from Red Lake to Sioux Lookout. It’s a walk for suicide awareness but also for a mother needing closure. What she will say in the room where Kanina died hasn’t come to her yet. Watch Kenneth Jackson’s story on Barbara Suggashie’s journey. Kanina had been in the child welfare system for several years. Until she filmed her death inside the home owned and operated by Tikinagan Child and Family Services. 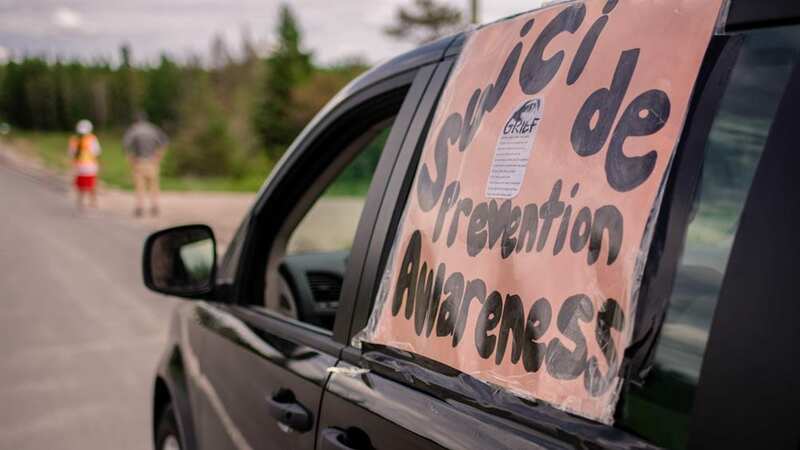 An APTN News investigation found Kanina was clearly suicidal, yet left alone for 45 minutes before a Tikinagan worker noticed she was gone. Suggashie says Tikinagan has never told how Kanina was left alone for so long. She then lays Kanina’s lifeless body on the floor, which isn’t visible in the video and leaves the room. She returns quickly talking on a cellphone with emergency personnel. She also appears to try to resuscitate Kanina by pumping air into her lungs with a plastic device. But it’s futile. Too much time has passed. “She’s gone,” the woman says as a baby can be heard crying from another room. Within minutes sirens are heard and paramedics arrive. “No pulse,” one of them is heard saying. Kanina Sue Turtle is in this undated photo from Facebook. Four days before Kanina killed herself, she was in the hospital for self-harming according to a video she posted on her Facebook account. It’s a recording of a live video where Kanina filmed what appears to be a Tikinagan worker sitting in a chair in the hospital room as they wait to be seen by a doctor. The unidentified woman talks on a mobile phone explaining to someone she is at the hospital with Kanina and how her shift is ending soon. Turtle begins the video by showing her injuries and says very little, other than she is bored. The worker agrees it is boring and notices there is no television to watch. “So quit cutting yourself so you don’t have to come here,” the woman says on Oct. 25, 2016. Kanina then turns the camera to the woman who is looking down at her phone. Kanina’s Facebook account gave many hints of her deteriorating mental state in the days leading up to her death. She had multiple hospital visits in the days leading up to her death and was walking around with bruising on her neck. A video on her Facebook posted Oct. 27, 2016, that was recorded live, shows the bruised outline of a noose across her neck. Then on Oct. 28, a day before her death, she attempted again and also filmed that. 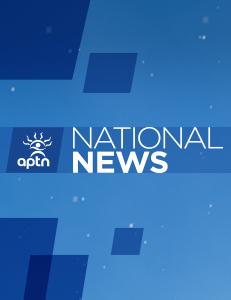 APTN has viewed that video. The video is just over a minute when she stops recording. She didn’t say anything in the video of her death. Kanina’s death is being reviewed by the chief coroner of Ontario that is looking into 11 deaths of children in the child welfare system, seven of which were Indigenous. The review was sparked after the coroner found issues in each of the deaths ranging from lack of proper care to untrained foster home staff. That review is expected to be complete this summer. As Suggashie and her son walk to Sioux Lookout a van follows close behind driven by a Tikinagan worker. The agency is also covering costs of hotel rooms. But Tikinagan still won’t say what went wrong in that home the day Kanina died. “I don’t know what the problem is with this Tikinagan. They are just hiding something. That’s what I think. That’s what my family thinks,” says Suggashie. APTN has repeatedly asked Tikinagan what happened but a spokesperson has maintained it can’t respond for respect of the family’s privacy. Tikinagan has never responded to questions. It suspected Kanina was also in a suicide pact. Tikinagan did warn APTN Tuesday about filming the home where Kanina died calling it a “safe haven” for kids as it is still being used. But it was supposed to be Kanina’s safe haven. Kanina’s brother, Winter, says he misses his sister. “I miss her giggles,” he says. There’s another purpose to the walk for Suggashie who wants to prove something Tikinagan. “I wanted to show them how much, how much I loved my daughter,” she says. 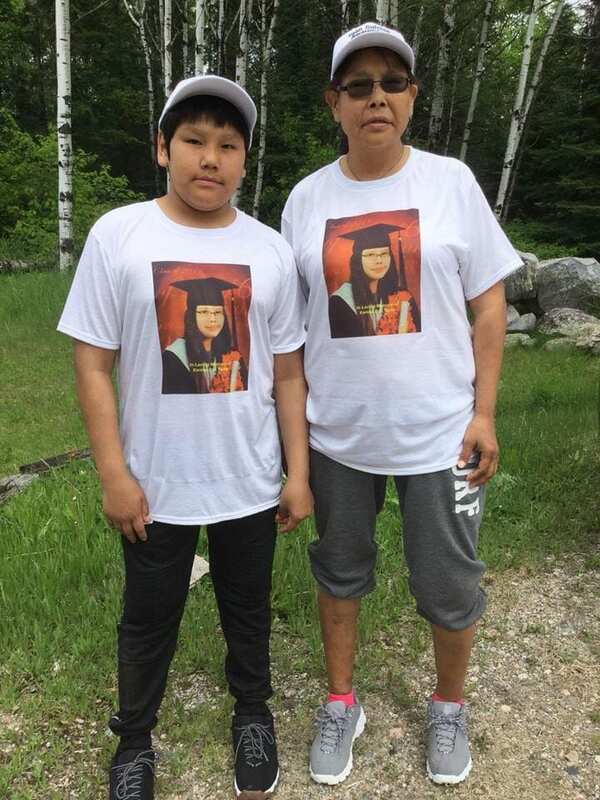 So she and her son keep going to Sioux Lookout where she hopes to find a way to keep going. Not only for her but for her other four kids who will be waiting for her when they are expected to arrive around Saturday. Prayers for you and your family .. I need my babies to in my life to long i need some help on that ..on how i go about getting them back ! I’m aware, be safe thinking of you on your journey. This lady inspired me for my WALK FOR CLOSURE also….I was wrongfully convicted and while I was in jail my wife passed away in a car accident…not a day goes by without feeling the pain i feel now. 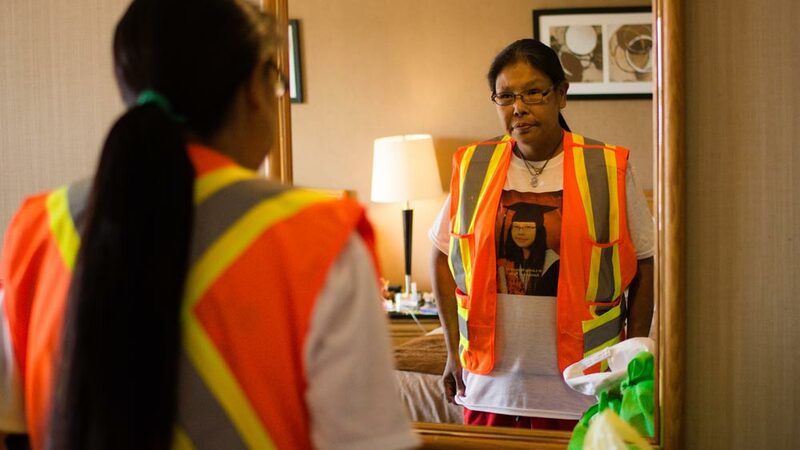 I plan to walk from Edmonton to Saddle Lake Reserve on June 24th where she is buried to her grave for the first time in 16 months in hopes for peace and some closure. I pray for this lady to give her the strength to get there…you are not alone.